Why It Is Critical to Take Pictures After a Car Accident | Merkel & Cocke, P.A. You are driving along your usual route when suddenly, “Boom!” you feel the impact, and everything slows down and then everything stops. You feel around to see if you have been hurt, you check on your passengers and the occupants of the other vehicle and then you call 911 for medical help and for the police to come to the scene of the accident. As soon as you know that you are OK, you should start taking pictures of the accident scene immediately. Soon, what happened in the crash might become a blurry image in your mind. You already know not to discuss the crash, apologize for anything because that could be taken as admitting fault. Although it seems like the images of the crash will be forever burned into your mind, here are some of the reasons it is critical that you start taking pictures right away and even shoot some video of the crash scene. The pictures you take and the videos you shoot that show the position of the vehicles in the intersection or on the roadway, it shows the weather conditions, level of daylight, damage to the vehicles and the location of the damage on each vehicle. All of these images can become valuable evidence when it is time to determine who caused the car crash. The pictures you take will become a vital part of your claim when you include pictures of your injuries (as much as they are visible), the condition of your passengers and whether they require medical attention. While you are snapping shots, take pictures of the surroundings. Are there traffic signs? Is there a red light, is there anything obscuring a diver’s view of important signage? If the accident took place in a commercial district, you might also enquire about surveillance video footage from nearby businesses that might have captured the accident. If there is an important detail, such as witnesses, the responding law enforcement officers and any other important details in the environment that will help when the time comes to reconstruct the accident. Before long, the vehicles will be moved, and vital evidence will disappear. 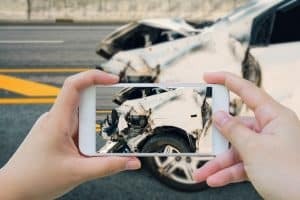 If you see witnesses or other onlookers taking pictures of the accident scene, ask for their contact information and if they would be willing to send you the images and testify about what they saw. After a car accident, you might want to consult with a Mississippi car accident attorney to find out what your legal options are for pursuing compensation. If you have been injured in a car accident, the experienced Mississippi car accident attorneys at Merkel & Cocke are ready to discuss your legal options. We have offices in Jackson and Clarksdale, but we also represent injured clients in and throughout Tupelo, the Gulf Coast Region, Tennessee and Arkansas. You are invited to call us today at 662-799-1633 or complete our contact form to schedule a free consultation.